It is incomplete. I’ve lived this; the empty nest, the building of a new one far away, it was great, but now. . .
. . . when one’s life partner dies too soon, always too soon, something breaks, shatters, sends bleeding shards in all directions, hews and hacks out chunks; cleaves rifts unrepairable. The joke turns on its head and destroys more than one ever thought possible and yet live. Ironically as she was dying my life force grew – mystified by a growing hunger, physical, sexual, adventurous, I thirsted for life. Unable to turn the tide and infuse this energy into her, it continued to grow in me. And then, those infinitely gentle last moments, like a wolf-pup trying to growl, her last breaths, then silence, peace, stillness. Hours later her open mouth, of its own accord, closed into a divine smile and so remained until I left her body three days later to be cremated. The crack widened as I turned my back and walked away. It began when I reached the parking lot, the ‘noneness’, my pieces began to break, the bleeding shards exploded, landed. 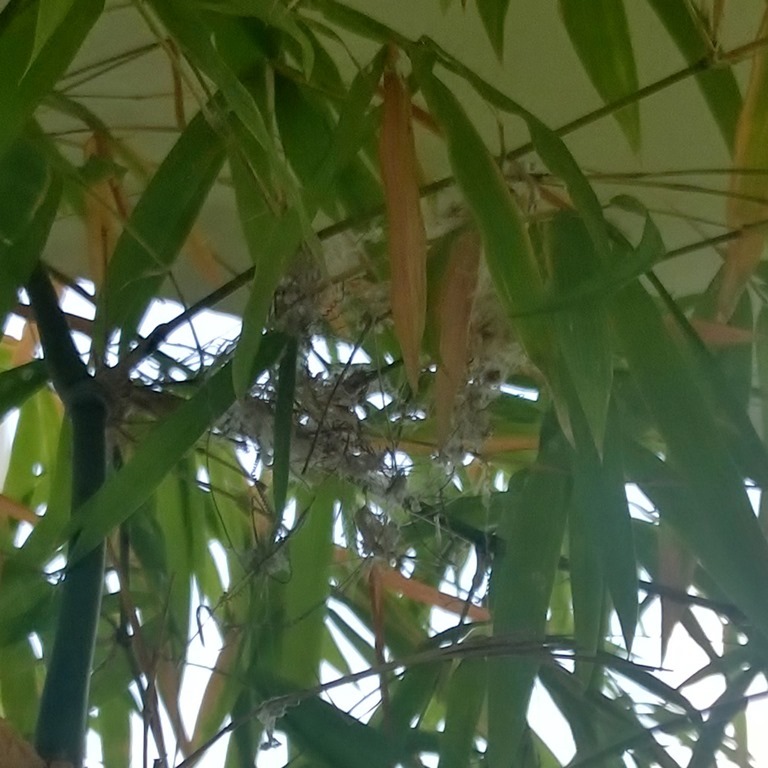 Returning to our home in Singaporean from my last trip two weeks ago, Mila, our angle-house-maid on her weekly visit, showed me a new Hummingbird nest, with two eggs in it, built high in the bamboo branches on our bedroom balcony. Though I’d been home for two days already and spent hours writing beneath it, I’d not seen it. I was overjoyed, became cautious, changed balconies for my writing and watched from a distance. Two days of storms and high-winds now assailed us. 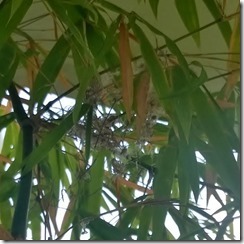 The plant and nest thrashed back and forth in the wind and torrential rains. The birds were gone. 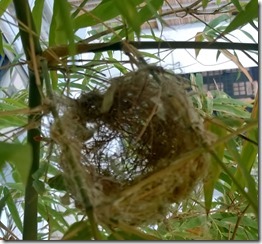 In the calm of the next morning, I climbed on stool to check – any empty nest, delicate, small, built with care and soft stuff – even Dominique’s long black hair – was in its fabric. It was a joy to behold, yet terrible in its gaping void. Bereft. 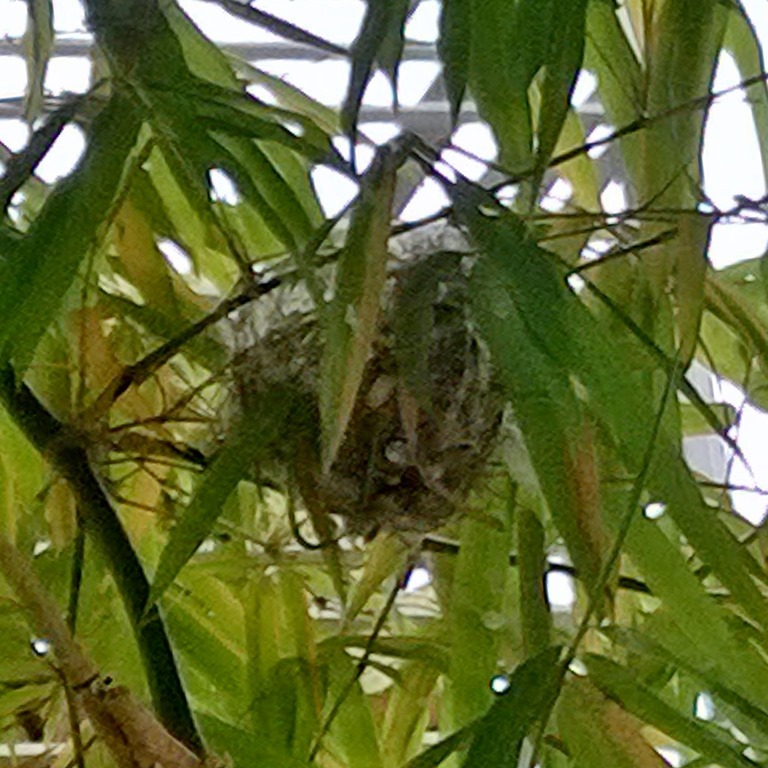 Over the last week, many birds have come, and I return to check. There is no nest; only a bare skeleton of what once was, the fabric, her hair, gone, perhaps to be used in a safer place, away from such winds and rain amplified by the height of my 8th floor perch; without the barren man living between worlds and I chose to believe to more fertile grounds. Is this not recycling at its greatest? 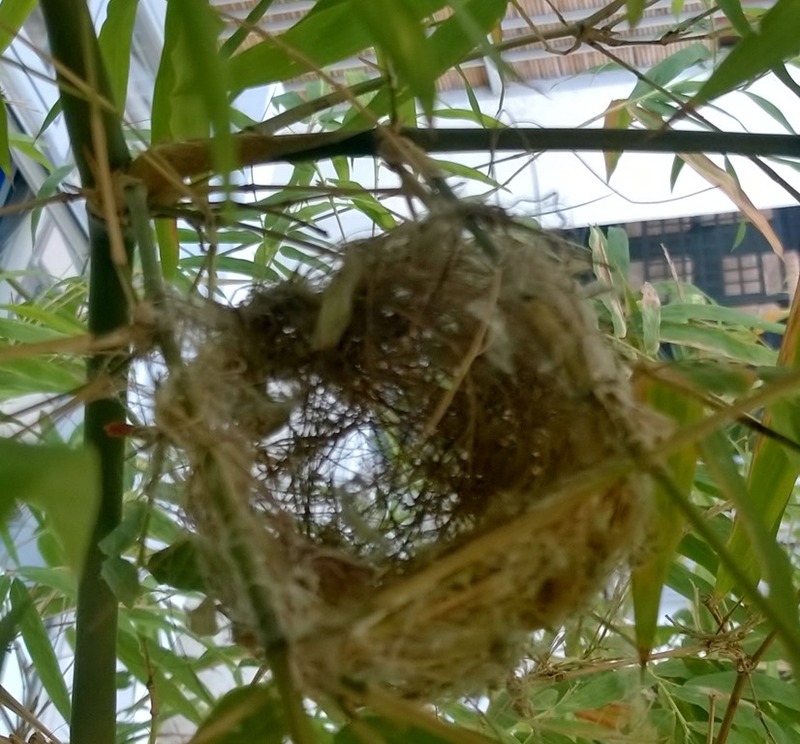 And subtle guidance for the path: there is no nest, though the skeleton remains, the fabric must be reused, distributed, shared and new nests built by all of us. Garçon : « Eggnog » avec une assiette de petits biscuits s’il vous plait ! Posted by Michael on Saturday, March 29th, 2014, at 13:22, and filed under Enigmas, Family, Sustainable.